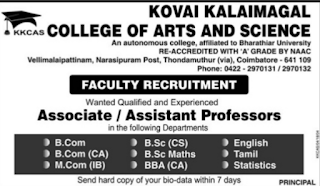 Kovai Kalaimagal College of Arts & Science, Coimbatore has advertised in DINAMALAR newspaper for recruitment of Associate Professor / Assistant Professor jobs vacancies. Interested and eligible job aspirants are requested to apply with in 7 days from 15th April 2018. Check out further more details below. Name of the College : Kovai Kalaimagal College of Arts &Science , Coimbatore. About College: Set in invigorating ambience, far from the madding crowd, Kovai Kalaimagal College of Arts and Science (KKCAS) Narasipuram, Coimbatore, was founded in the year 1996. It is a Co-educational institution run by the Kovai Kalaimagal Educational Trust and has the locational advantage of providing a distraction-free learning environment. How to Apply: Interested candidates are requested to send hard copy of your Bio-data with in 7 days to postal address provided below.